Customization, once seen as a luxury, can now be found in all facets of consumer products. The newest trend: controlling your home with your fingertips from anywhere in the world. With the launch of everything electronic and motorized, handheld devices such as your smart phone or tablet are now able to control almost anything with the touch of a finger. With the newest builds and renovations, home automation, in some form or another, is being specified into the design. Technology has catapulted the use of home automation to the next degree and has become more popular – and more affordable. Home automation spans a wide breadth of components: from controlling a home’s lighting and window coverings by using a smart phone or tablet, to scheduling timers throughout the day, to turning on and off your central heating and home-entertainment systems. New builds and renovations are taking advantage of open walls, and the trend of installing hidden speakers, wireless routers and other normally obvious audio components into the walls makes the final interior design seamless. Even motorized tracks can be hidden within the ceiling, hiding drapery tracks, for example, which creates additional visual height with true floor-to-ceiling draperies. Trending with window shades is the option for motorization, as well. The sleek and contemporary designs of roman shades, cellular blinds, even the newest in vertical blinds, can be motorized and fit in perfectly with contemporary home décor. And with many more affordable products on the market, consumers are able to have luxury items without paying the luxury ticket. The popularity of LED lighting is making a huge impact in interior design. Custom LED home lighting has moved from just changing a light bulb to installing fully recessed indoor perimeter lighting, and even offers various outdoor applications, such as illuminating walkways, pathways and porch lights. Kitchens are the heart of any home, and esthetic is just as important as functionality in the design of a great kitchen. Hardware mechanisms that provide soft-close drawers and cabinets add an extra bit of luxury to a kitchen’s everyday use. Whether choosing contemporary handles in clear acrylic and chrome, or streamlined and contemporary push-touch cabinetry instead, the selections of hardware are endless. 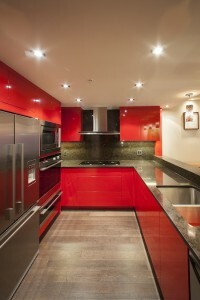 The esthetic is just as important as functionality in the design of a great kitchen. Acrylic elements are also creeping into today’s homes in versatile ways other than in the kitchen. Resembling glass, acrylic gives the illusion of glass without the fragility and weight. One of the ways this medium is making a statement in contemporary interior home design is molded into contemporary sculptures. On its own or in a collection, acrylic sculpture can offer a focal point to any room. Some acrylic sculpture suppliers give the option of custom colors, adding an extra personal touch to a statement piece or collection. Especially when beautifully lit, acrylic sculpture brings simple elegance to the home. Don’t forget about the importance of fabric in home design. This year, texture is big and the more layered the better! Mix different textures with bold patterns to make a statement, or mix soft and sleek textures to create a luxurious atmosphere. Fabrics enhance a room’s décor, creating soft, easy lines and offering points of visual interest. By playing with color and lots of layered textures, interiors are warming up to cheerful design and easy, comfortable living. Michelle Diaz is a design assistant at RodRozen Designs. The firm, now celebrating its 10th anniversary, is proud of its achievements in the interior design and construction trade. Consisting of co-owners Derick and Steven RodRozen and a design team, RodRozen Designs strives to create uniquely stunning and luxurious homes throughout the Lower Mainland. For more information, visit rodrozen.com or email [email protected].